According to a new report by the Associated Press, abortion rates in the United States have fallen nearly 21% since 2010. The drop is attributable to a number of factors ranging from widening access to birth control, to restrictive TRAP laws and the nationwide closure of about 70 abortion clinics. Several of the states that have been most aggressive in passing anti-abortion laws — including Indiana, Missouri, Ohio, and Oklahoma — have seen their abortion numbers drop by more than 15 percent since 2010. 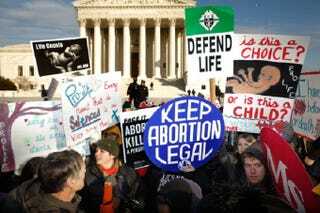 But more liberal states such as New York, Washington and Oregon also had declines of that magnitude, even as they maintained unrestricted access to abortion. Thus the drop in abortion rates isn’t attributable to one singular reason, but it’s likely that the decline of the teen pregnancy rate plays a significant role. Louisiana — where abortions increased 12 percent between 2010 and 2014 — was recently honored by Americans United for Life as the No. 1 state in taking steps to reduce access to abortion. In both Louisiana and in Michigan, where abortions rose by 18.5 percent, the increases were due in part to women coming from other states where new restrictions and clinic closures have sharply limited abortion access. Anti-abortion groups said many Ohio women were going to Michigan and many Texas women to Louisiana. In contrast, states that have done little to restrict abortion access, and have instead invested in widening access to health insurance and low-cost contraception, have seen the most significant decreases in abortion rates.